Hilton Garden Inn New York/Times Square Central is a brand new contemporary hotel that debuted on famous 42nd Street in September 2014. This 36-story hotel is perfectly situated on 42nd Street between Broadway and 6th in the heart of Times Square /steps from the New Year*s Eve Ball Drop./ and is surrounded by Broadway theaters restaurants shopping and nightlife. The hotel is walking distance to Radio City Music Hall Rockefeller Center Madison Square Garden Madame Tussaud*s Restaurant Row the Port Authority Bus Terminal Penn Station Grand Central Station major public transportation including bus and subway and Jacob Javits Convention Center. Hilton Garden Inn New York/Times Square Central offers 282 brand new guest rooms with modern amenities including a 50-inch flat-screen TV and plush bedding. Business amenities include a large work desk with ergonomic chair and lap desk. Onsite amenities include Paul*s on Times Square an upscale restaurant open for breakfast lunch and dinner as well as room service. Enjoy the vibrant lobby bar overlooking Times Square. Complimentary amenities include Business Center Fitness Center in-room internet access lobby WiFi and morning coffee/tea available in the lobby. There is a Concierge and Theater Ticket Desk in the hotel lobby as well as a 24-hour Pavilion Pantry offering your favorite snacks beverages sundries and gifts. The hotel has one onsite boardroom which seats up to 14 people. Conveniently located within 20 miles of JFK LaGuardia and Newark Liberty International Airports Hilton Garden Inn New York/Times Square Central places you within steps of all that Manhattan offers. The hotel is 100 percent non-smoking. The hotel allows service animals. Room-key access elevators and on-site security is provided. 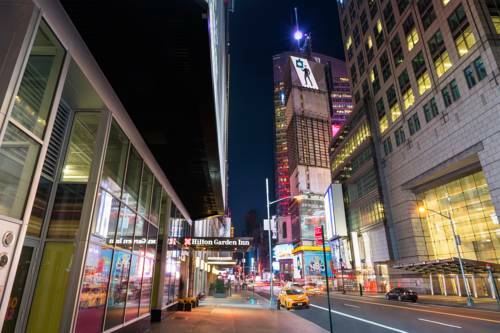 Hilton Garden Inn New York/Times Square Central offers nightly room service. Enjoy a quiet dinner from the comfort of your newly built guestroom. Hilton Garden Inn New York/Times Square Central offers complimentary coffee and tea each morning. Paul*s on Times Square is located in the hotel lobby and open daily for a scrumptious breakfast buffet /including specialty stations featuring cooked-to-order eggs and more/ as well as lunch and dinner. The restaurant is newly built with modern decor and floor to ceiling views of Times Square.